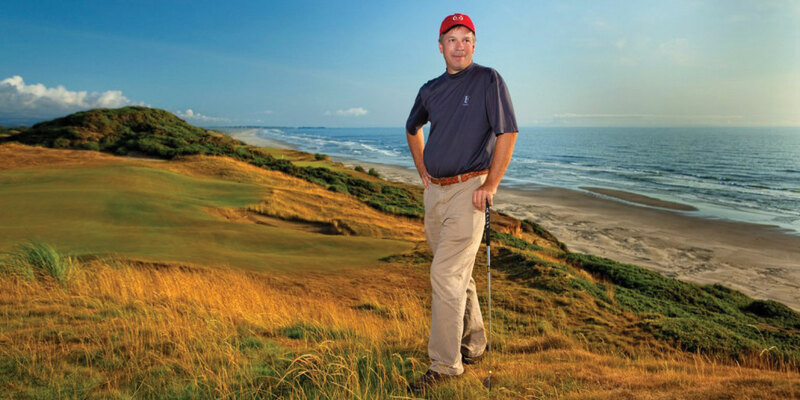 A golfer’s bucket list of courses likely includes “Top 100” links by golf course architect Tom Doak, such as Pacific Dunes in Oregon and Tasmania’s Barnbougle Dunes. With his new project at Forest Dunes Golf Club in Roscommon, MI, Doak’s own bucket list—of golf courses he’d like to design—is shorter by one. Enter Forest Dunes owner Lew Thompson’s quest for a companion to his highly-acclaimed Tom Weiskopf course. “When I first met Lew and went to look at the property and saw it was fairly open, fairly flat, I thought it would work for this idea.” Importantly, Doak adds, “Thompson didn’t say anything about it being ranked in the Top 100 courses—he already has one of those. He wanted something that would make people say ‘Wow.’” And, Thompson admits, he wanted something to keep golfers for another day of play-and-stay at his Adirondack-style lodge. Doak’s second Michigan course was Black Forest, at Wilderness Valley in Gaylord (“one of the hardest courses I’ve ever built”); since then, he and his team have handled new courses and renovations across the U.S. and around the globe, from Mexico to Scotland and China. Doak is looking forward to more time with his family as he and associate Brian Slawnik develop the Roscommon project, due to open in 2016.